As an elementary teacher, you know that students are different and learn differently. And yet, when students enter your classroom, you somehow must teach these unique individuals deep mathematics content using rigorous standards. Is differentiation really the answer? How can it be done well and in less time? Nationally recognized math differentiation expert Nanci Smith debunks the myths, revealing what differentiation is and isn’t. In this engaging book Smith reveals a practical approach to teaching for real learning differences. You’ll gain insights into an achievable, daily differentiation process for ALL students in the K-5 classroom. Theory-lite and practice-heavy, this book shows how to maintain order and sanity while helping your students know, understand, and even enjoy doing mathematics. Classroom videos, teacher vignettes, ready-to-go lesson ideas, and rich K-5 mathematics examples help you build a manageable framework of engaging, sense-making math. 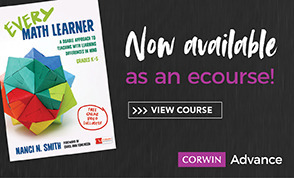 This book includes classroom videos, in-depth student work samples, student surveys, templates, before-and-after lesson demonstrations, examples of 5-day sequenced lessons, and a robust companion website with downloadables of all the tools in the books plus other resources for further planning. Every Math Learner, Grades K-5 will help you know and understand your students as learners in order to provide daily differentiation that accelerates their mathematics comprehension. "This is an extremely important topic right now. Young students are expected to learn concepts that used to be saved for much more mature students. The big questions are how to help those young minds understand, especially when the teachers may not have a strong mathematics background? The coverage [in this book] is very complete without being overwhelming. I am impressed that just as I began to think what an insurmountable task teaching has become, [this book] breaks it down to manageable chunks." “Every Math Learner is a powerful tool for educators serious about meeting the needs of all learners in their mathematics classrooms. Nanci Smith balances philosophy with practicality while providing a glimpse into real classrooms with real students. Teachers will ultimately learn how to lift students up to their greatest potential in learning."